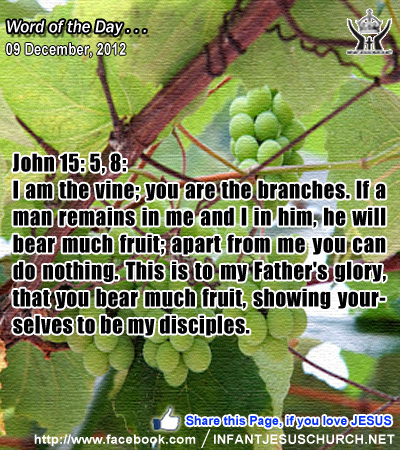 John 15:5,8: I am the vine; you are the branches. If a man remains in me and I in him, he will bear much fruit; apart from me you can do nothing. This is to my Father's glory, that you bear much fruit, showing yourselves to be my disciples. Heavenly Father, we want to obey your word, your will, and your model. We want to obey you to respect you, to love you, and to know you. So please, help us better come to know you as we more closely walk in your steps. Help us to know what it means to live your life in my world. In the name of Infant Jesus' we pray and thank him as our Lord. Amen. 1In the fifteenth year of the reign of Tiber'i-us Caesar, Pontius Pilate being governor of Judea, and Herod being tetrarch of Galilee, and his brother Philip tetrarch of the region of Iturae'a and Trachoni'tis, and Lysa'ni-as tetrarch of Abile'ne, 2in the high-priesthood of Annas and Ca'iaphas, the word of God came to John the son of Zechari'ah in the wilderness; 3and he went into all the region about the Jordan, preaching a baptism of repentance for the forgiveness of sins. 4As it is written in the book of the words of Isaiah the prophet, "The voice of one crying in the wilderness: Prepare the way of the Lord, make his paths straight. 5Every valley shall be filled, and every mountain and hill shall be brought low, and the crooked shall be made straight, and the rough ways shall be made smooth; 6and all flesh shall see the salvation of God." How can we, like John the Baptist, prepare ourselves for the coming of Jesus Christ and his everlasting kingdom of virtue, peace and joy? John the Baptist tells us that the first step is change and repentance - turning our hearts and minds away from sin, unresponsiveness, and unbelief, to a sincere trust in God and submission to his word. Luke's gospel highlights the universal call of the gospel to all peoples without difference. He quotes from the prophet Isaiah that "all flesh shall see the deliverance of God". John stood at the door of a new era of grace and deliverance. He saw from a distance what Jesus the Messiah would achieve through his death and resurrection - pardon for our sins, healing and return, and eternal life for all who would believe in the Lord Jesus. Are we hungry for the Word of God and do you allow God's word to change the way you view, think, and live your life? Loving Infant Jesus, you are the Word of God and Savior of the world. Fill us with your Holy Spirit and educate us your ways that we may grow in the knowledge of your love and truth. May we bring the joy and good news of the Gospel to all we meet today.